Solid parquet block flooring is extremely recognisable once it has been installed. The small block of hardwood have been made into parquet block from once single piece of solid wood. They have been machined into shape and will provide a smooth, flush finish once installed. Because of the size and shape of the block of flooring, you are able to create geometric patterns such as ‘herringbone’, ‘basket weave’ and ‘brick bond’. To create ‘basket weave’ the width of the block must divide equally into the length. With a choice of patterns, parquet block flooring truly allows you to bring out your creative side and produce a floor in a style that suits the décor and surroundings. Why should I choose solid parquet flooring? Solid parquet block flooring has the ability to transform a room in any style of property into an elegant and luxurious space. It is an excellent choice if you want your flooring to add character, personality and charm to your home. Parquet blocks are quite versatile and can be laid out in a variety of patterns depending on your personal preference. While the size of the block remain the same you can find parquet block in different species of hardwood and with different finishes. 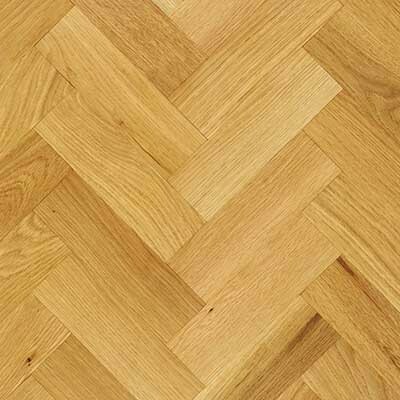 The most common type of solid parquet flooring is unfinished Oak. This really allows you to create a truly unique floor as you can chose the pattern to lay the block in, along with any colour stains and the type of finish that you would like. If you are still not about which style of flooring will best suit your needs, then have a look at our Wood Flooring Guide, which offers more information on the structure, profile and finishes of our hardwood floors. You may also find the following article useful: What is parquet block flooring? Yes, we have a range of flooring accessories which will either match or complement your choice of flooring. Our range of solid wood flooring profiles will add the finishing touches to any flooring project, and we are sure to have everything you will need to make your room look prefect. We also have a large range of cleaning products which have all been specifically designed to be used on wooden floors. Take a look at our Wood Floor Maintenance and Care Guide for some tips on how to keep your hardwood floor looking fresh and new. Yes, as well as solid parquet block flooring we also sell the more traditional solid plank flooring. If you are uncertain about which flooring type to choose then we also stock a vast range of engineered hardwood, and laminate flooring. If you would like to have a look at any of our floors then we have them all on display in our showroom. Alternatively you can order free samples so that you can look at them in the comfort of your own home. If you have any questions or would like advice about our floors, then please contact us and we will be happy to help.